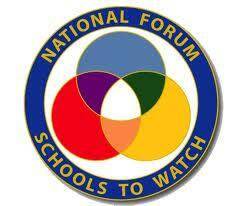 The Schools To Watch Program is a copyright protected program of the National Forum to Accelerate Middle Grades Reform. Criteria established by the National Forum is used as the basis for the Forum’s Schools To Watch Program, which focuses on school improvement efforts characterized by a continuous trajectory toward success. The following Self Study and Rating Rubric may be used freely by any middle grades or secondary school to study and rate its practices. No adaptations to this self-study and rubric may be used without written permission from the Schools To Watch Committee and Board of the National Forum to Accelerate Middle Grades Reform. The rubric is a continuing-improvement tool as well as a mandatory self-rating for schools interested in applying for a state Schools To Watch designation. Schools applying for a STW state designation should be consistently averaging scores between 3.4 and 4.0 in all sections and components. The rubric is divided into four sections: Academic Excellence, Developmental Responsiveness, Social Equity, and Organizational Support and Processes. Under each section there is general criteria followed by concrete, expected examples of excellence. Self-rate each general and detailed component.Your self-ratings should reflect your perceptions for your whole school, not for your specific classroom, grade level, or subject. The ultimate goal is to be consistently excellent and rate a well-evidenced score point FOUR in every component (general and detail) of every section. Even when that ultimate goal is reached, a true high performing middle school will continue to seek ways to improve as new challenges arise. A FOUR in any general and detail component means the practice is highly and completely implemented, systemic, coherent in every classroom, by every teacher, across the school.A THREE in any general and detail component means that there is a high degree or maturing quality of implementation that is systemic, but it may not be coherent or of the highest quality in every classroom and by every teacher, but certainly by most, 75 percent or better. A TWO in any general and detail component means that there is a mixed, fair, immature quality of implementation. A TWO also means that practices may include many teachers but not the majority. The program may be too new to have realized accountable results or to be evaluated as effective. A ONE in any general and detail component means that the practice may just have gotten started, (very immature), or is only practiced by a handful of practitioners. Are you interested in using the Self- Rating Rubric in your school? For a cost of $300.00, you can access the online electronic data system and receive a comprehensive report of the results. To get your school set up, contact Tina Jamison at tina.jamison@scamle.org.